1. Why is RO a Good Water Filtration Option? 2. What is Reverse Osmosis & How Does Reverse Osmosis Work? 3. What Does an RO Filter System Do? 4. How Does an RO Membrane Work? 5. Are All RO Drinking Water Systems the Same? 6. How Much Maintenance Does an RO System Require? If you’re looking for a water filter that will provide outstanding drinking water for your home or business, Reverse Osmosis (RO) filtration is one of the most popular and best water filtration methods available. In simple terms, reverse osmosis works as water is forced across a semi-permeable membrane, leaving contaminants behind that are flushed down the drain. The clean drinking water collects in a holding tank. Below you will find diagrams, charts and explanations to answers your questions about RO systems. If you have other questions which are not answered here, please visit our our main water education page or Contact Us. 1Why is Reverse Osmosis a Good Water Filtration Option? We’ve been in the water filtration business since 1991 and have found Reverse Osmosis filtration to consistently be one of the best ways to achieve superior water for the home and business. RO filtration improves taste, odor and appearance of water by removing contaminants that cause taste and odor problems. With an RO system, you can cancel your water delivery service and stop purchasing cases of bottled water. Reverse Osmosis filtration provides “better-than-bottled water” quality water for just pennies per gallon. RO systems have very few moving or replaceable parts make RO systems easy to clean and service. RO systems remove pollutants from water including nitrates, pesticides, sulfates, fluoride, bacteria, pharmaceuticals, arsenic and much more. An RO systems’ carbon filter will also remove chlorine and chloramines. Installed at the kitchen sink: A small RO filtration system can be installed at the kitchen tap to provide top-quality drinking water. This is called a “point of use” (POU) water filtration system and can also connect to your fridge and ice machine. Water pressure is a consideration with some refrigerators, so be sure to refer to your RO system’s owner’s manual as the pressure from the Reverse Osmosis unit is about two-thirds of the incoming line pressure. Related content: Can I Install a Reverse Osmosis System Myself? Whole-house RO system: A whole-house Reverse Osmosis system (also called a POE “point of entry” system) allows you to have filtered water at all sinks, showers and appliances throughout the house. A POE system ties into the main water line coming into your home and is generally installed in the garage. This type may not always be an available option due to the upfront cost of such a large filtration system, as well as requiring more long-term maintenance and service. Reverse Osmosis is a perfect fit for many businesses. 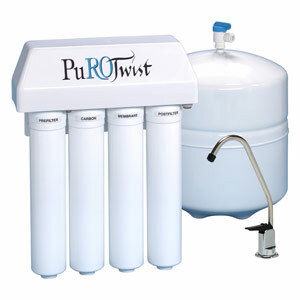 At ESPWaterProducts.com, we carry a wide variety of large RO systems designed for many different commercial applications. 2How Does Reverse Osmosis Work? How does Reverse Osmosis remove impurities? Reverse Osmosis water purification process is a simple and straightforward water filtration process. It is accomplished by water pressure pushing tap water through a semipermeable membrane to remove impurities from water. This is a process in which dissolved inorganic solids (such as salts) are removed from a solution (such as water). What happens to the contaminants that don’t pass through the membrane? When household water pressure pushes water through the RO membrane and additional filters, such as sediment or carbon filters, the impurities are filtered out and subsequently flushed down the drain. What is left, is delicious, clean-tasting drinking water.  Note that many RO units incorporate a 4 or stage process for optimal water quality. You may be interested to know that Reverse Osmosis technology is not new. In fact, RO processes began being utilized by municipalities back in 1977. Since then, Reverse Osmosis has become increasingly popular because it is safe, cost-effective, and easy to maintain. RO Filter Systems: What are the basic components of an RO System? Most RO systems look similar and have the same basic components. Although most RO systems look and work basically the same way --they differ in the QUALITY of their components. Pre-Filter(s): Water from the cold water supply line enters the Reverse Osmosis Pre Filter first. There may be more than one pre-filter used in a Reverse Osmosis system, the most common being sediment and carbon filters. These pre-filters are used to PROTECT the RO membranes by removing sand silt, dirt, and other sediment that could clog the system. Additionally, carbon filters may be used to remove chlorine, which can damage the RO membranes. Reverse Osmosis Membrane: The Reverse Osmosis Membrane is the heart of the system. The semipermeable RO membrane is designed to remove a wide variety of both aesthetic and health-related contaminants. After passing through the membrane, the water goes into a pressurized storage tank where treated water is stored. Post filter(s): After the water leaves the RO storage tank, but before going to the RO faucet, the treated water goes through a final “post filter”. The post filter is usually a carbon filter. Any remaining tastes or odors are removed from the product water by post filtration “polishing” filter. Automatic Shut Off Valve (SOV): To conserve water, the RO system has an automatic shut off valve. When the storage tank is full, the automatic shut off valve closes to stop any more water from entering the membrane and blocks flow to the drain. Once water is drawn from the RO faucet, the pressure in the tank drops; the shut off valve then opens to send the drinking water through the membrane while the contaminated wastewater is diverted down the drain. Flow Restrictor: Water flowing through the RO membrane is regulated by a flow restrictor. There are many different styles of flow controls, but their common purpose is to maintain the flow rate required to obtain the highest quality drinking water (based on the gallon capacity of the membrane). The flow restrictor also helps maintain pressure on the inlet side of the membrane. Without the additional pressure from the flow control, very little drinking water would be produced because all the incoming water would take the path of least resistance and simply flow down the drain line. The flow control is most often located in the RO drain line tubing. 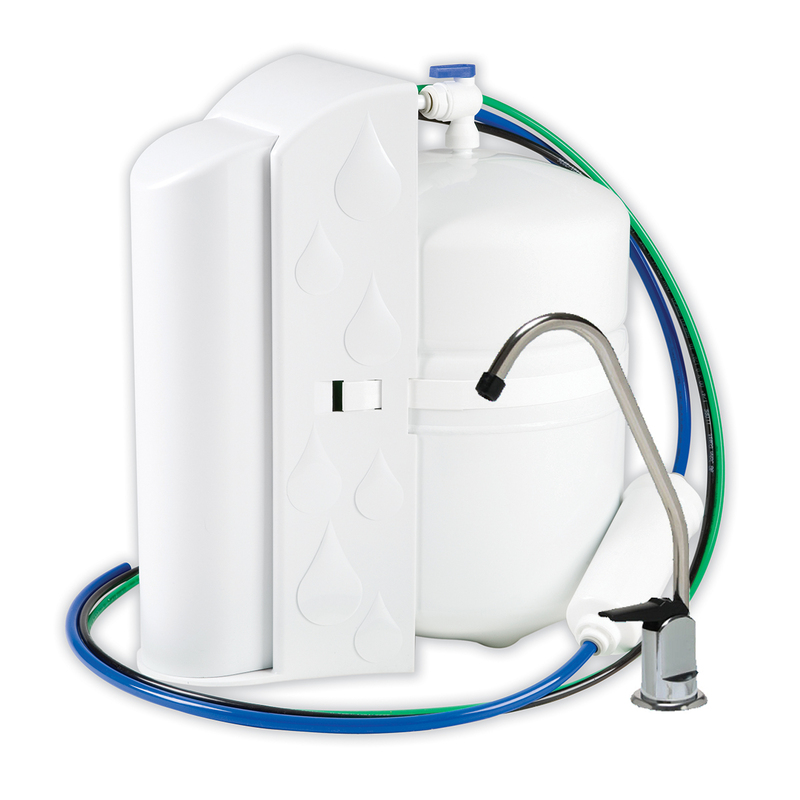 Storage Tank: The standard RO storage tank holds from 2 - 4 gallons of water. A bladder inside the tank keeps water pressurized in the tank when it is full. The typical under counter Reverse Osmosis tank is 12 inches in diameter and 15 inches tall. Drain line: This line runs from the outlet end of the Reverse Osmosis membrane housing to the drain. The drain line is used to dispose of the wastewater containing the impurities and contaminants that have been filtered out by the reverse osmosis membrane. We’ve researched to find the BEST Reverse Osmosis Systems for 25+ Years! At ESP Water Products, we’ve been selling water filtration equipment for 25+ years. This longevity in the industry has made us very selective in what we sell and endorse. We carry only RO systems that have won our confidence--those that are manufactured with the highest-quality components, offer outstanding warranties, and have the highest ratings for customer satisfaction. 3What does a Reverse Osmosis system do? Public water suppliers work hard to provide clean water for their customers. The problem is that there are many contaminants, especially those that cause taste and odor issues, which are simply not EPA regulated. These contaminants can easily penetrate aquifers, streams and rivers, bringing impurities straight to your water lines. That’s where Reverse Osmosis comes in. With a Reverse Osmosis filtration system, you can filter out impurities and produce outstanding drinking water for your home or business. Want to know more about what a Reverse Osmosis system can remove? 4How does a Reverse Osmosis Membrane work? 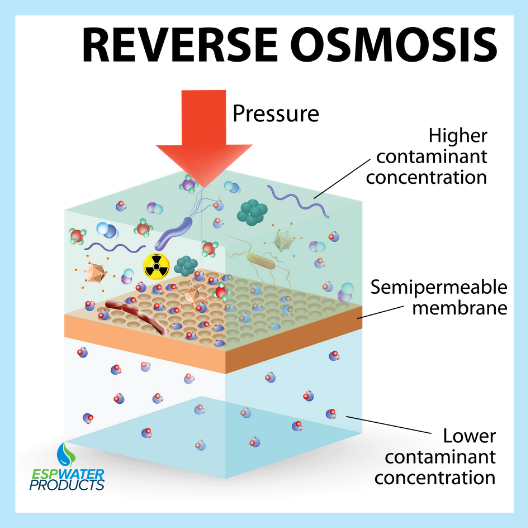 Reverse Osmosis (RO) is a water treatment process that removes contaminants from water by using pressure to force water molecules through a semipermeable membrane. During this process, the contaminants are filtered out and flushed away, leaving clean, delicious drinking water. Reverse osmosis is capable of removing up to 99 percent of 65 different contaminants (see partial list below), including lead, fluoride, chlorine, dissolved salts, and more. This pre-filter stage is designed to strain out sediment, silt, and dirt and is especially important as the sediment filter protects dirt from getting to the delicate RO membranes that can be damaged by sediment. The carbon filter is designed to remove chlorine and other contaminants that affect the performance and life of the RO membrane as well as improve the taste and odor of your water. The semipermeable RO membrane in your RO system is designed to allow water through, but filter out almost all additional contaminants. 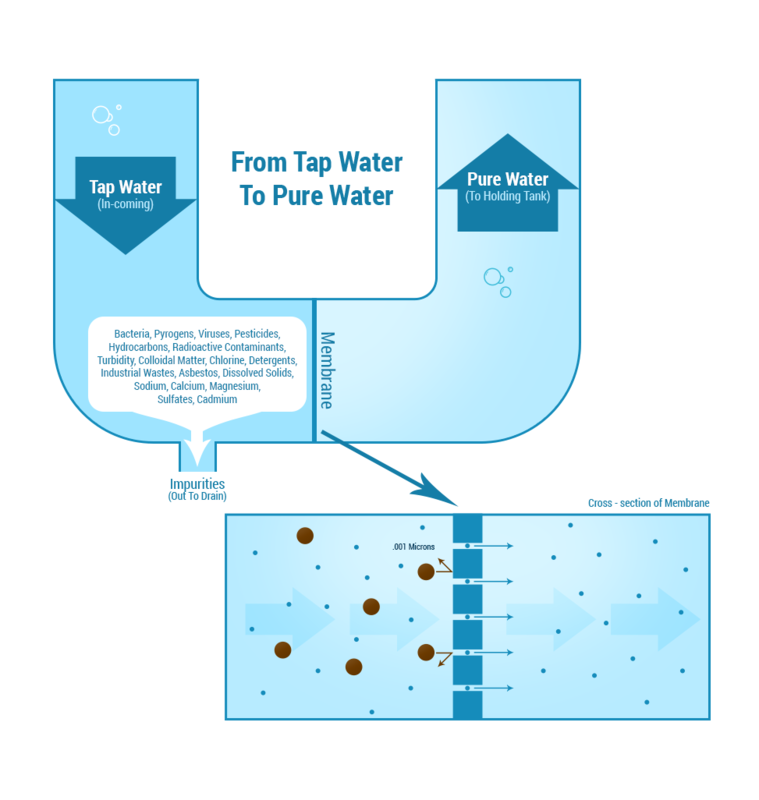 In a four-stage RO System, a final post filter (carbon filter) will “polish” off the water to remove any remaining taste and odor in the water. This final filter ensures you’ll have outstanding drinking water. 5Are all Reverse Osmosis drinking water systems and filters the same? There are many different Reverse Osmosis (RO) water filtration systems on the market. While one RO System may look like the next in terms of design and components, there can be substantial differences between systems. Quality components are the key to an optimal functioning RO System. In our 25+ years in the industry, we’ve found that the quality of components is truly the key differentiation between systems. This is because RO units manufactured using excellent craftsmanship, as well as superior parts and components are what ultimately produce the best intended results--top-quality water for the home and business. Does this system have good reviews? Does it use quality parts from trusted manufacturers, and are the materials FDA or NSF (National Sanitation Foundation) approved? Some systems have higher contaminant rejection abilities. How does this one compare to others like it? Read up on the company. Is it reputable? 6 How much service and maintenance does an RO system require? 1. Replacement filters: RO membranes and filters will need to be replaced every 6 months to 2 years depending on the type of filter, your water quality and your water usage volume. This guideline is very general. Specific information about how often your membrane or filter should be replaced can be found in the products’ “Specs” or your product owner’s manual. If you’ve purchased a system or filter from us in the past, we will send reminder emails when it comes time to change your filter. 2. Electricity Charges: All of our residential Reverse Osmosis systems require no electricity, running only on water pressure. Some of our larger commercial systems do have to use electric pumps, but even then the power requirements are minimal. 3. Annual Maintenance: We recommend that you have your RO system sanitized and filters changed once each year. This can be done by the homeowner or by a local water treatment professional. A water professional can provide needed maintenance service or consult your RO system’s owner’s manual. 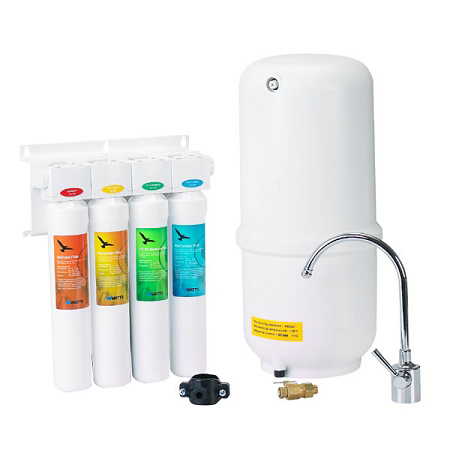 We also carry kits and the filters to perform the annual sanitation and filter change if you’re a do-it-yourself type. If you properly care for your Reverse Osmosis system (annual cleanings plus change out filters/membranes on time), your system should have a very long lifespan; we’ve seen properly-maintained systems last 10-15 years! We highly recommend that you purchase replacement filters from us, as we only carry top-quality filters that are designed for optimal performance and reliability. 1. Where is an RO system stored? Phase One: This is a pre-filtration phase designed to protect the unit’s membranes by reducing fine, suspended materials that can clog the system. Phase Two: The second phase involves filtration to remove chlorine since chlorine can damage thin film-material membranes. Phase Three: This is a semi-permeable membrane designed to remove a wide variety of both aesthetic and health-related contaminants. The water goes from here into a pressurized storage tank to hold the treated water. Phase Four: The final stage in the RO process is usually a carbon post-filtration phase that will remove any remaining aesthetic taste or odors --a “polishing stage”, if you will. 2. Can an RO system be connected to my fridge or ice machine? Under-the-counter reverse osmosis systems are plumbed to the incoming cold water line, drain, and an independent faucet. But it is possible for a water treatment professional to plumb an RO unit to your fridge and/or ice machine, as well. The water professional will most likely run a quarter-inch tube from the under-sink RO unit to your fridge. Water pressure is a consideration with some refrigerators, so be sure to refer to your RO system’s owner’s manual as the pressure from the reverse osmosis unit is about two-thirds of the incoming line pressure. 3. How much water can an RO system produce each day? The typical under-counter reverse osmosis tank is 12 inches in diameter and 15 inches tall. The reverse osmosis system will operate under water pressure ranging from 40 to 100 psig and generate ten to 75 gallons (that’s 45-340 Liters) per day. 4. Is a Reverse Osmosis System Noisy? Generally, reverse osmosis systems are very quiet-- though you may hear a “gurgling” sound as the “concentrate” or waste water flows from the membrane to the drain. Reverse osmosis is designed so that “crossflow” water flushes the contaminated concentrate away from the system. This flushing keeps the unit from fouling. If you hear other sounds, such as a “hissing” noise, immediately call your local water treatment professional as there may be a problem with water pressure, the air gap or a leak. 5. Do you need electricity to operate RO? No. A residential reverse osmosis system simply runs on water pressure from household plumbing and requires no electricity. The exception to this is large commercial or industrial RO systems. These large systems use pumps to feed water through the filtration process. 6. How does RO water compare to bottled water? Most people prefer reverse osmosis-filtered water over bottled water. An RO system that incorporates carbon filtration will remove chlorine, chloramines, arsenic, pesticides, herbicides and more. The removal of these contaminants not only makes for safer drinking water, but also greatly improves the taste. The RO process leaves trace amounts of minerals and salts which makes for an overall better taste rather than the “flat” taste of distilled bottle water. Best of all, RO-filtered water saves you the expense of bottled water and is better for the environment since you’re not adding water bottles to local landfill. 7. How long will a reverse osmosis system last? With proper maintenance, an RO system can last for many, many years. Filters should be changed at their scheduled replacement times. The carbon, sediment, and final polishing filters are generally changed out every 12 months and the RO membrane filter is replaced every two years. (These are general recommendations but water usage and household size are the determining factors). Occasionally, tubing or the holding tank will need to be replaced, but overall, RO systems are very simple and easy to maintain and will operate for many years. 8. Is an RO system worth it? 9. Will reverse osmosis remove minerals that are healthy to keep minerals in water? Tap water varies with each city and water source. Some tap water is heavy in mineral content which can affect the taste and smell of water. Filtering water with a reverse osmosis system will remove the majority of minerals in water and greatly improve the aesthetics of drinking water. Because minerals in water are in an inorganic state that our bodies cannot digest, removing the minerals does not make RO-filtered water unhealthy. So keep in mind that while minerals are essential for proper health, food is the primary source of the minerals our bodies need to be healthy, and in a form our bodies can digest.